I used this fox pattern from Stitched by Crystal. This gal knows her shtuff. Check her out. And then I mocked up my own Grumpy Cat face. I used cream, brown and heather gray fleece for the body and face. I used brown for the tail. To make the face, I traced the pattern face and drew my rendition. 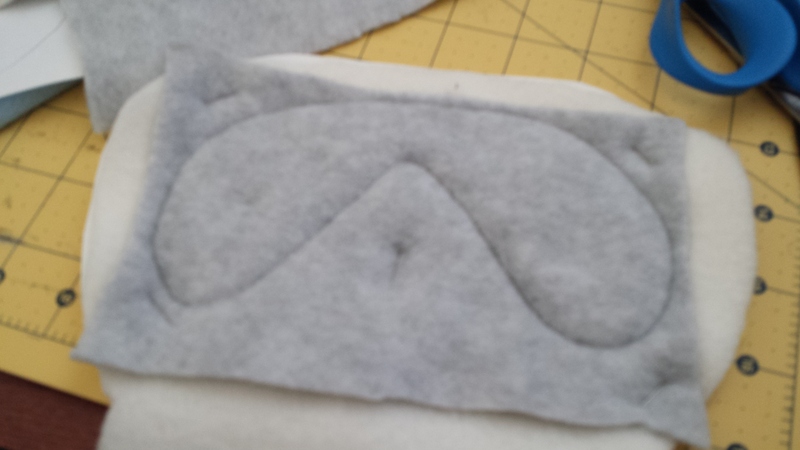 Then I appliqued each piece. 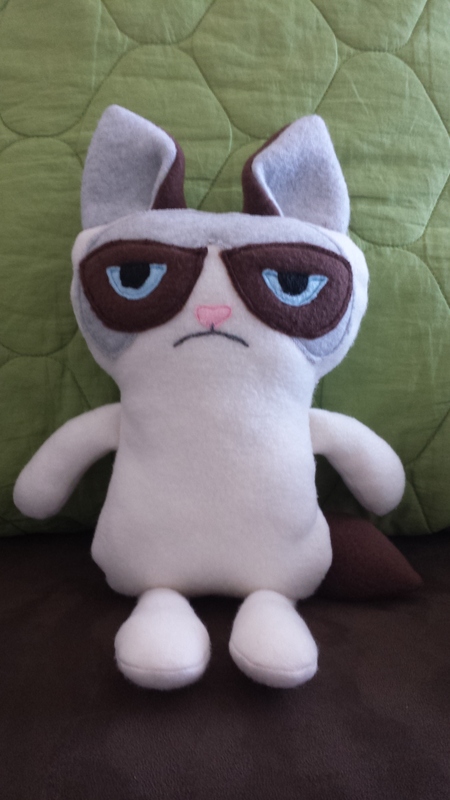 Here’s the Grumpy Cat Applique in PDF form if you want to make your own. I haven’t appliqued many things in the past, so I improvised. 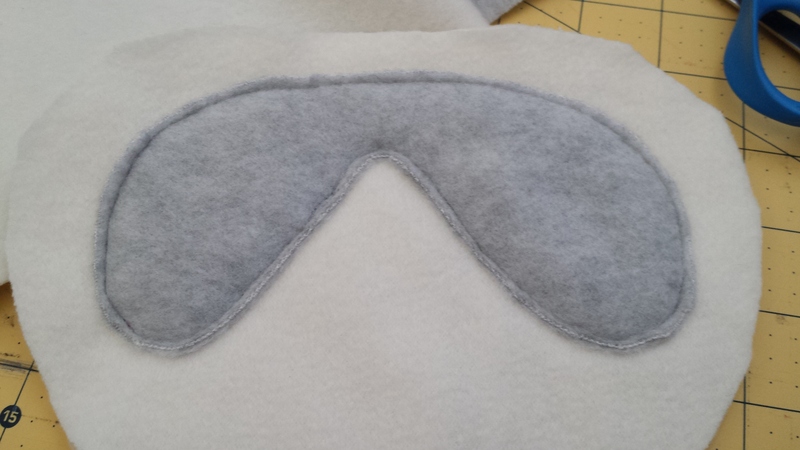 I’m not sure if this is the proper or the right way to applique fleece, but it was a winner for me! 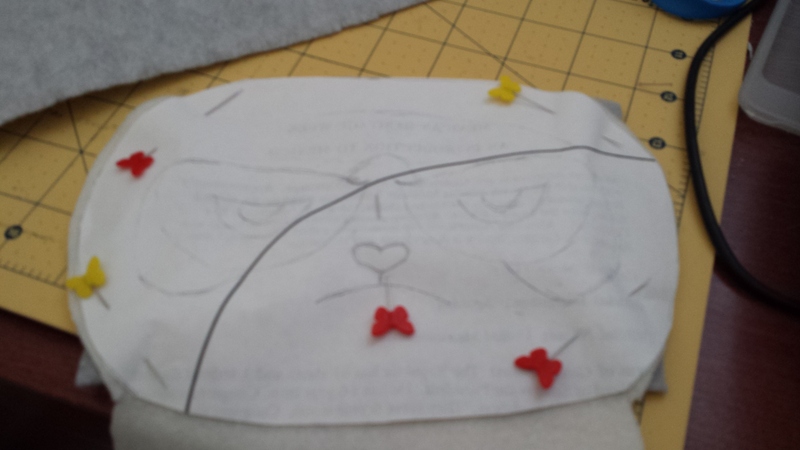 I cut out my pattern and pinned it directly on to the wrong side of the face while simultaneously pinning the applique fabric to the right side of the face. I started with the gray part of the face first. 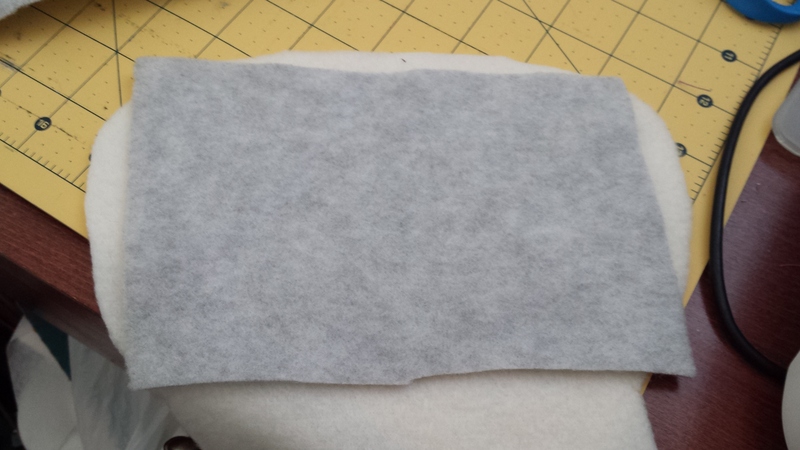 I sewed directly on the paper. 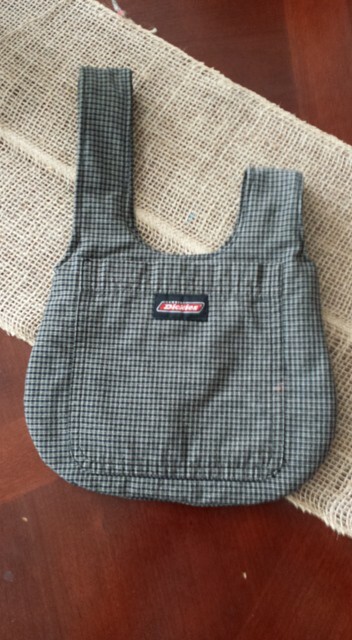 If you are proficient with free motion stitching – have at it! Not so for me, though. Just go slow, set your needle in the down position and pivot a lot. 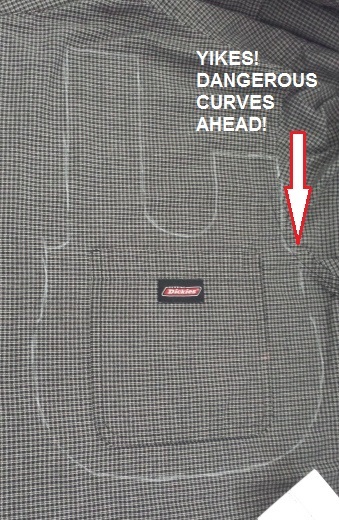 Trim as close to the stitch line as you can. Then I followed it with the brown spots over the eyes (they remind me of Bono’s sunglasses). 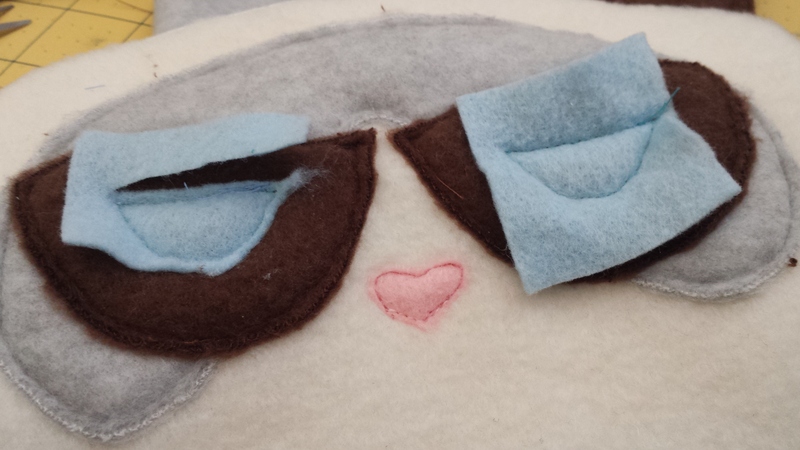 Then I appliqued the nose and the blue part of the eyes. I used 2 plies of unraveled worsted weight gray yarn for the mouth and two plies of unraveled worsted weight black yarn for the eyes and embroidered them on. Then I finished the rest of the body as per the tutorial. 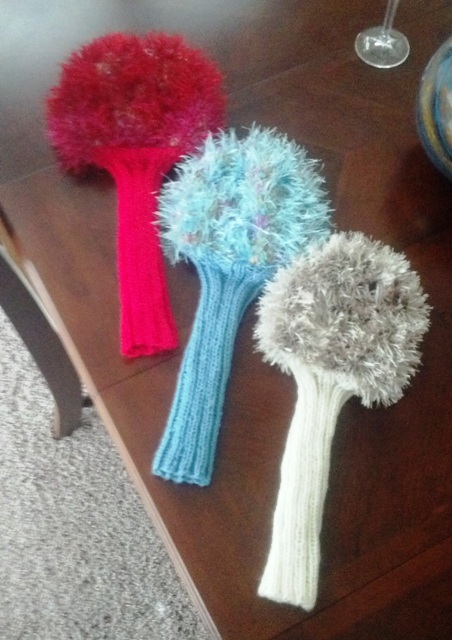 All three of them made in a day! 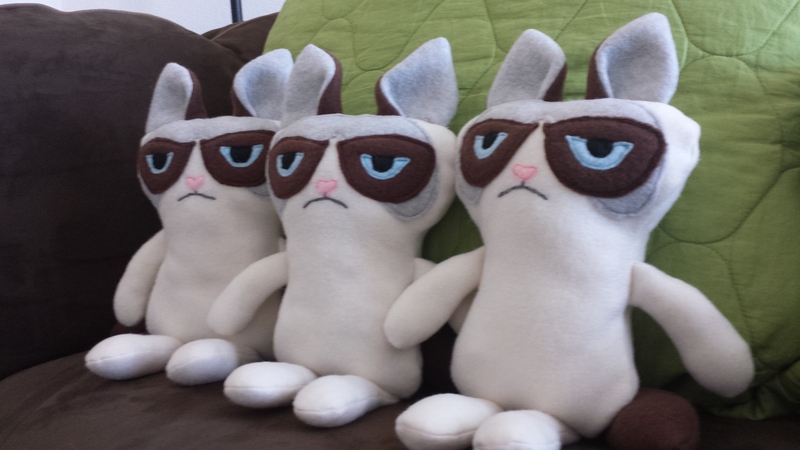 This entry was posted in Baby, DIY, Plush, Sewing, Uncategorized and tagged Ben Bernanke, fleece, grumpy cat, plush, plushie, sewing, tardar sauce. Bookmark the permalink. Looks like a lot of work but they are amazing, great outcome! 🙂 I still love the grumpy cat! These are so cute and funny!! Thanks! They were a lot of fun to make! So cute… I mean grumpy. 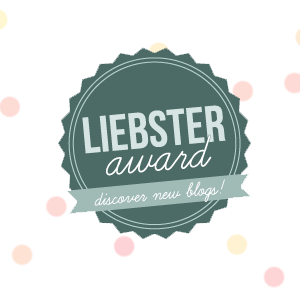 Love, and I learned something new! I would have tried to sew on each eye piece and didn’t even think about cutting it after!!! I’m learning all the time! Thanks! Oh my gosh great job!!!!!! It looks JUST like Grumpy Cat!